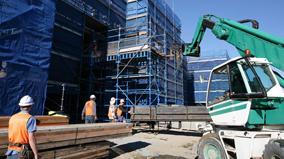 The Australian Building Codes Board administers the National Construction Code (including the Building Code of Australia Volume 1 and 2 and the Plumbing Code of Australia Volume 3), which sets the design and structure standards of buildings in Australia. The Building Code of Australia's accessibility requirements apply to public premises, and are not a legal requirement if you are designing or building a private home. ensure your home meets your needs, and your family's needs, over time. ensure your home is accessible to other people in the community, including your family and friends-as well as prospective tenants or purchasers. Universal design supports an approach to building and house design that caters to the needs of people with all abilities in the community. promoting ease on approach to housing features and elements. Examples of design and product features for homes and living spaces that are consistent with each guideline for universal design are available on the ANUHD website. The following organisations can provide more information about topics relating to accessible home renovations and universal design. Your local council may also be able to help. Information is available for people who work in the building industry about obligations and requirements with building accessible places.